ATV, the thermal transfer specialists have announced the release of a “Perfect Soldering”, tabletop model at the forthcoming Productronica exhibition. The perfect soldering systems, solder reflow ovens (SRO) with rapid thermal annealing and brazing capability are IR lamp heated multi-purpose “cold wall” process ovens. The SRO is ideal for R&D, process development as well for low to high volume production. Applications include: Die attachment, IGBT/DBC, high vacuum encapsulation, MEMS package sealing, IR sensor/Crystal package sealing, wafer level packaging, thermo electric cooler/Peltier, low moisture package sealing, high power LED, laser bar, Getter activation, alloying, wafer bump/solder ball reflow, pin fin heat sink, backing, flip chip, 3 D-CSP, diffusion bonding, CPV, thermo compression bonding, pin fins, Hybrid assembly, MMIC die attachment, power modules, electric vehicle controls and power solar cells etc. The system is ready to use, out-of-the-box, incorporating a formic acid capability and diaphram vacuum pump. The operating temperature range is 450 to 750°C with a heated area of 230 x 217mm. SemiProbe produce a range of manual probe systems suitable for Universities, Research & Development facilities, Laboratories and for low volume testing & characterisation requirements, including the cost-effective LAB Assistant and Probe System For Life (PS4L). 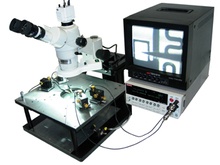 The low-cost LAB Assistant is available in either DC or HF configurations for 6″ or 8″ wafers / devices and includes all the options required to start testing, out-of-the-box. The modular Probe System For Life (PS4L) platform, unique to SemiProbe, can be configured according to budget or initial requirements for components up to 300mm. This capability allows the system to be field upgraded with enhanced testing features or levels of automation. We are pleased to announce the publication of the latest issue of our Newsletter – Inseto Connect, which is dedicated to providing information on new products, supplier & company news and technical announcements. Download your copy HERE or from the News Section of our website. Inseto To Exhibit At EMPC2011 In Brighton 12-15 Sept.